The superfamily Ichneumonoidea has been estimated to contain well over 80,000 different species. 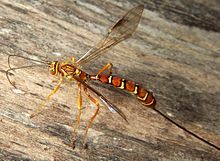 The ichneumon wasps are more familiar to non-entomologists, being larger and about three times as diverse as the braconids. They are solitary insects, and most are parasitoids; the larvae feed on or in another insect which finally dies. Being in the same order, ichneumons are closely related to other hymenopterans, such as ants and bees. Members of the family Ichneumonidae are usually larger than members of the Braconidae, and are distinguished primarily by details of wing venation. Many species in both families use polydnaviruses to suppress the immune systems of their host insects. Ichneumon wasp species are highly diverse, ranging from 3 to 130 mm (0.12 to 5.12 in) long. Most are slender, with the females of many species (particularly in the genus Megarhyssa) having extremely long ovipositors for laying eggs.